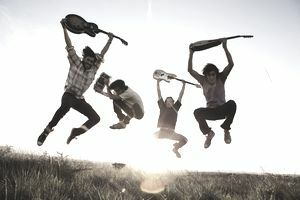 You're taking band photos to get the band exposure in the press and to present a visual image of the band. While this may seem obvious, it's a good thing to keep in mind when preparing the shoot and taking the photos. Are the photos likely to be published? Assuming they are, is the image of the band the one that you want to be presenting to the public? Photographing more than one or two people can be hard. You don't want the pictures to end up looking like someone's wedding photos, a class photo or police mugshots (unless of course, that's the image you're going for). Before you take the pictures, think about the positioning of the photo. When it comes time to shoot, take as many different shots as you can — you can never have too many to choose from. In many ways taking live photos can seem like the easiest option — for a start, all the band members are likely to be in the same place at the same time. However, there are a few pitfalls. Unless the photo will be accompanying a review of a live event, most magazines and newspapers won't want to use a live photo. Although the whole band will be on stage at the same time during a live event, it may be hard to get a good shot of all of them, and with fast movement and low lighting levels, concerts are one of the hardest environments to photograph. A good live shot can be a useful addition to a press pack, but it isn't a replacement for a well-staged band photo. If you are a photographer and in the band, avoid taking the photos yourself if at all possible. While most cameras have the ability to take a timed portrait (giving you, as the photographer, a chance to get into the picture), it's not a good idea to use that function — you'll get much better results by asking someone outside of the band to take your photographs. It also could be beneficial to work with another photographer — you can exchange ideas, and she may have some good suggestions. The world is full of aspiring photographers, many of whom would love to photograph your band. To find one, put an ad on the board in a local camera shop or at an art college. Many new photographers will be happy to work for free to gain experience, but it's a good idea to at least offer to cover their expenses. You also should ensure they are credited when the photos are published. Yes, saving high-resolution photos uses up memory fast. But the media outlets using your photos will want a high-resolution file, and if the image you provide isn't high-resolution enough, they just won't use it. Make sure you do your research — check with media outlets beforehand to obtain their photo guidelines and follow those guidelines to the letter regarding resolution and file type. Once you've got the photos, avoid compressing the files — if the file is too big, the media outlet can shrink it. When composing a photo, split the frame into thirds, and remember that the eye is drawn to circles and triangles. Ultimately if you're going to be any good, you have to learn to go with your gut. Don't be scared to use photo editing software. It can be lots of fun, and if you don't get the perfect image, you can manipulate your pictures until you do.